Zion Market Research has published a new report titled “Air Conditioning Market By Product (Room/Unitary Air Conditioners, Chillers, VRF Systems, Coolers, and Others), By Component (Compressor, Evaporator, Fan, and Condenser Coil), By Technology (Automatic Air Conditioning, Manual/Semi-Automatic Air Conditioning, Invertor, Split A/C, and Others), and By End-User (Commercial, Residential, Industrial, and Others): Global Industry Perspective, Comprehensive Analysis, and Forecast, 2018–2025”. 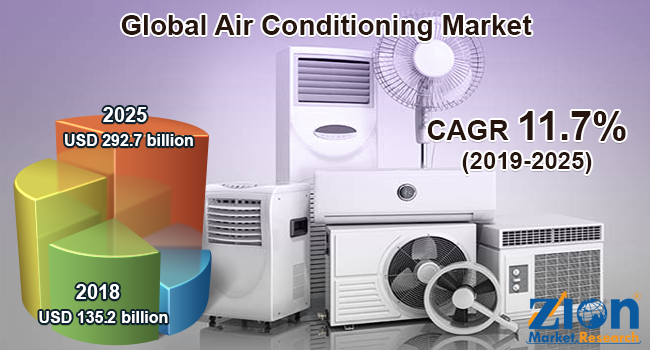 According to the report, the global air conditioning market was valued USD 135.2 billion in 2018 and is expected to reach around USD 292.7 billion by 2025, at a CAGR approximately 11.7% for the forecast period from 2019 to 2025. Air conditioning, generally known as AC, A/C, or air con, involves disposing moisture and heat from the enclosed and occupied area and making the environment comfortable for people. It is also used for spaces with electronic gadgets to keep maintain a controlled temperature. The global air conditioning market is likely to grow significantly in the upcoming years, due to improving economic conditions, rising per capita income, and increasing pollution levels. Technological advancements witnessed in developing countries are also driving the air conditioning market globally. The rising level of air pollution is harming not only the environment but also the people living in that particular environment. Pollution is giving rise to fatigue and headaches, which are common symptoms caused by poor air quality. This is further propelling the global air conditioning system market. However, the high cost of air conditioning system may hinder this market’s growth. As air conditioning has become more of a necessity keeping aside the needs and wants, the challenge for air conditioning manufacturing companies will be to make air conditioning systems cheaper and more effective than before. By product, the market includes room/unitary air conditioners, chillers, VRF systems, coolers, and others. By component, the market includes a compressor, evaporator, fan, and condenser coil. The technology segment includes automatic air conditioning, manual/semi-automatic air conditioning, inverter, split A/C, and others. The end-user segment includes commercial, residential, industrial, and others. The demand for air conditioning in the residential sector will hold a substantial share, owing to the rising demand for air conditioning systems in household appliances and home air conditioning and urbanization. Technological advancements across various verticals and lucrative investments in the automobile sector are anticipated to further fuel the demand for ACs over the projected timeline. By region, North America is expected to hold a substantial share of the global air conditioning market in the future, owing to the recent changes made to the standards of American Society of Heating, Refrigerating, and Air Conditioning and the presence of prominent players like Siemens Building Technologies, Goodman, and Lennox International in the region. The Asia Pacific is anticipated to depict substantial growth over the forecast time period, due to the growing inclination toward a comfortable lifestyle and the rising awareness about energy-efficient and eco–friendly electronic devices. The Middle Eastern and African air conditioning market is expected to witness considerable growth in the years ahead, due to the rising use of consumer electronics across the region. Some key players of the global air conditioning market include Midea Group, Hisense Electric Co., Carrier Corporation, Panasonic Corporation, Hitachi Ltd., Samsung Electronics Ltd., LG Electronics Inc., Daikin Industries Ltd., Electrolux AB, Sharp Corporation, and Mitsubishi Electric Corporation.